It’s raining cats. And sometimes, dogs. How exciting! I managed to get my “My First Game Jam” jam game entry game jam game completed! Jam. Game. Not only did I finish the game logic, but I also had time to add a title screen, a game over screen (complete with stats), and some sound effects. And! Some music! Now, I can’t take credit for composing the music (that was Grieg), but I did have to learn how to translate sheet music into PICO-8 music and then sequence it all and stuff. I’m a musician now, as well as a game developer. Wow! But you don’t want to hear about all that. 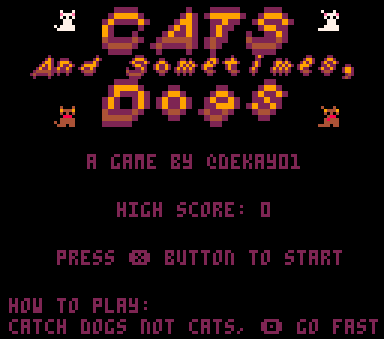 No, you want to actually play my damn cat-dog game, right? There you go. Just click in it – it’s the actual game! 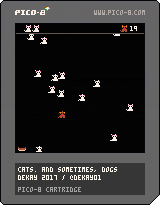 If you have PICO-8, you can download this PNG below, which is also the actual game, and load that into it. Or just search for it using Splore. My hiscore is 58, by the way. You get an extra life every 50 points, and it gets harder every 20 points.